First stop Wasilla, AK, where we spent time with Damon's family. 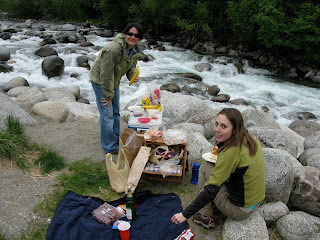 Picnicing and hiking with friends at Hatcher's Pass. We kept ourselves busy. Damon built a tool shed for his dad, and took a trip to Kodiak. I took a knitting class, and made a scarf and dish cloth. A highlight of the summer was our trip to Hong Kong and Japan. A highlight of the trip was visiting the family that Damon stayed with when he was an exchange student to Kanayama, Japan. We stayed with Tony (far left), from Ketchikan, AK, and his family.